Pneumatic conveyors are used to move grain and other products using air. Pneumatic conveyors are more flexible than augers because the duct does not need to be in a straight line. They are self-cleaning, and do not have an exposed auger at the inlet. They do require more horsepower per bushel and are noisier than augers. Three types of pneumatic conveyors are used: positive pressure (push units), negative pressure (vacuum), and a combination of negative and positive pressure. In a positive pressure unit, a blower supplies the pressure, and the product enters the air stream through a rotary air lock. 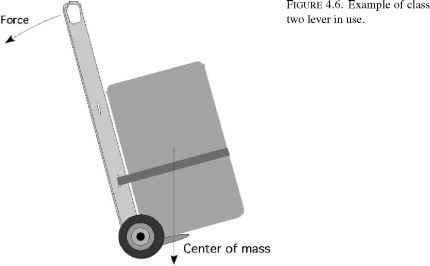 The material then is blown through the duct, Figure 20.2. 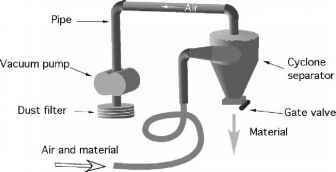 In a negative pressure unit, the material is vacuumed up by the inflow of air and then separated from the air in a cyclone separator. The material collects in the bottom of the separator where it can be released with a gate valve or a rotary lock. The air continues on to the pump and out through a filter into the atmosphere, Figure 20.3. In a combination system, the material is picked up by the inflow of a negative pressure system, and then it passes through a rotary air lock into the positive pressure air stream coming from the pump. FIGURE 20.2. Positive pressure pneumatic system. FIGURE 20.3. Negative pressure pneumatic system.